Ulmschneider, Katharina and Crawford, Sally 2011. Post-War Identity and Scholarship: The Correspondence of Paul Jacobsthal and Gero von Merhart at the Institute of Archaeology, Oxford. European Journal of Archaeology, Vol. 14, Issue. 1-2, p. 231. Crawford, Sally and Ulmschneider, Katharina 2011. 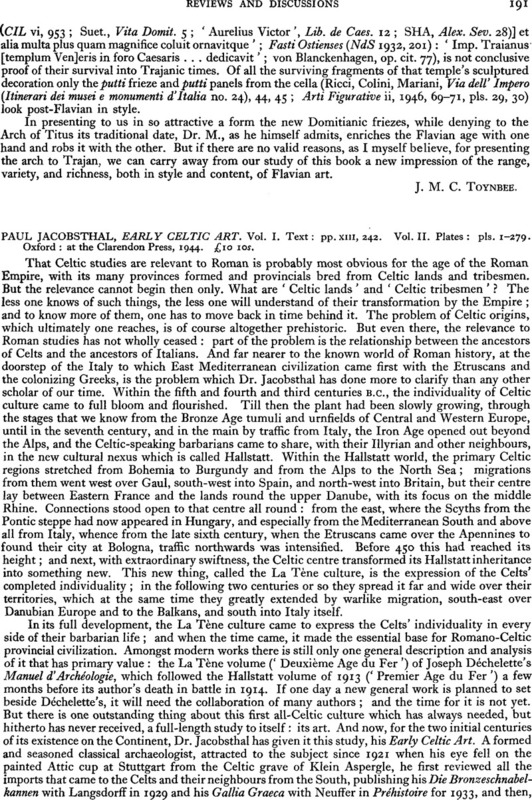 Paul Jacobsthal's Early Celtic Art, his anonymous co-author, and National Socialism: new evidence from the archives. Antiquity, Vol. 85, Issue. 327, p. 129. Megaw, Ruth and Megaw, Vincent 2001. Expressiveness and communication: Insular Celtic art through six centuries. Antiquity, Vol. 75, Issue. 288, p. 433. Megaw, Ruth and Megaw, Vincent 1994. Through a window on the European iron age darkly: Fifty years of reading early Celtic art. World Archaeology, Vol. 25, Issue. 3, p. 287.